Stand-up lifts help to ensure greater safety when transferring patients. Stand-up patient lifts are also better for the caregiver since they do not have to physically lift patients to aid them during transfers. Stand-up patient lifts come in many varieties and options, so it might seem overwhelming to evaluate them all. However, we work to make the process simpler for you. Here are eight of the best stand-up lifts. It is ergonomic and has innovative adjustment features for multiple body sizes. The Invacare Get-U-Up Hydraulic Stand-Up Lift has a weight capacity of 350 pounds. It allows for optimal comfort at any width and height. This lift allows for multiple positions due to its adjustable support. This lift can accommodate standing and four-point sling types. The slings are multi-purpose and allow users to access a toilet, get full-support transfers and use stand assist with ease. The slings are sold separately. The footplate is retractable and non-slip providing greater transferring stability. The wheels move easily on all surface types. This lift is ergonomic. This feature helps to ensure a comfortable and easy movement whether the patient is receiving assistance from a caregiver or not. Adjust the leg supports and take advantage of the soft pad for added comfort. There are three positions for the legs. This lift has multiple transfer functions and the ability to fit through narrow doorways. 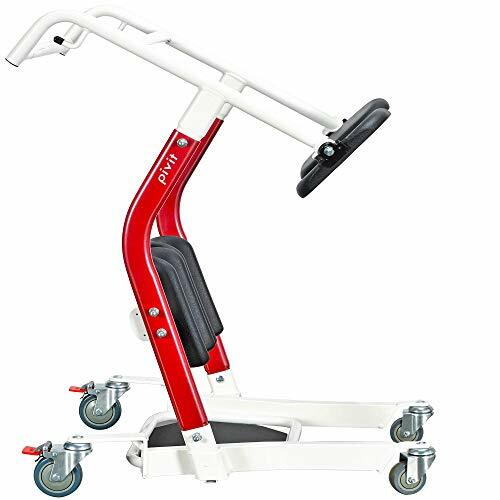 The Pivit Stand Assist Patient Transport Lift can accommodate up to 400 pounds. It has low-profile legs and can wheel across most floor surfaces with ease. It is ideal for transferring patients to toilets and wheelchairs. Patients only require minimal assistance to use this lift. This lift allows patients to maintain their independence because it reduces their fall risk. They only need to use their upper body strength to pull themselves into an upright position. The knee pads are soft, and the split seat has padding for comfort. For safe unloading and loading, the seat swings out. The lift is a heavy-duty steel material. The rear casters lock into place to ensure safety. This lift offers additional security with its dual grab bars, and non-slip footrests. It easily maneuvers through small areas, and it is lightweight. This lift only weighs 71 pounds, making it easy to move around and use. 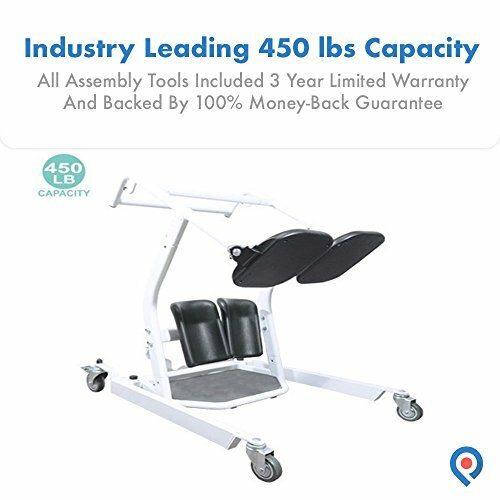 The Pivit Stand Assist Patient Transport Lift 450 Pounds can accommodate patients up to 450 pounds. It allows patients to move between seated surfaces quickly, as well as get into the standing position. The attached seat lets patients who are partially mobile to take rests as they move around. This lift makes it easy to access the toilet and chairs because the base legs close and open. They are wide, making it possible for them to fit around most surfaces. The footrests are non-slip, giving patients stability when entering and exiting the chair. The seat pads and knee pads have an ergonomic design. This design ensures optimal comfort and support. Both of these pads also have sufficient padding. The construction is a durable and robust steel for longevity. However, it is also lightweight and maneuvers easily in small spaces to provide independence for patients. Allows for fast transfers with its four-point sling, non-slip footplate, and easy maneuverability. The Drive Medical Stand-Assist Lift weighs 113 pounds, so it is relatively lightweight, making it easy to move around on most surfaces. It can accommodate patients up to 400 pounds. This lift uses a 24-volt battery that charges quickly by using a wall-mount charger. When the battery hits 50 percent charged, it provides an audible alert so that patients and caregivers know when it is time to plan for a charge. If the battery runs out of a charge when you are using the lift, there is an emergency stop feature. When this happens, you can use the manual lowering capabilities to transfer the patient safely. The footplate is non-skid, and it is extra-wide. This feature ensures greater security when patients are trying to stand or transfer to a toilet or chair. The leg supports are adjustable, and they have support straps and soft pads. This device works as a general lift for partial weight-bearing and as a commode lift. 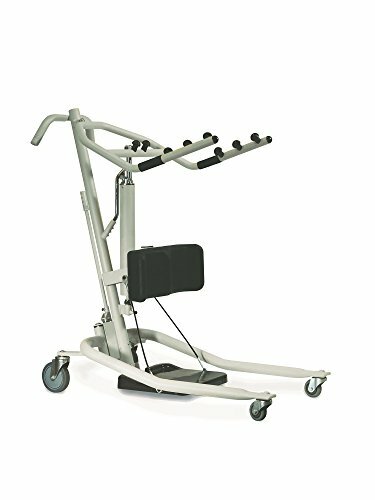 The Bestcare Lifts Stella Stand Assist Power Lift has a weight capacity of 400 pounds. The construction is durable, but it is also lightweight. The total weight of the device is 116 pounds. This lift doubles as a toilet lift. The handles are large and ergonomic, ensuring comfort and easy use. The foot pedal base is comfortable and ensures greater security for patients. The foot platform also releases quickly. The knee pad unit is soft and adjustable, and allows patients to move around easier. The device also has a low base height, so that it can move right up to multiple surfaces. Keep your charger and slings in the accessory storage bag. The sling types this lift accommodates is a standing sling. Charging the battery to full capacity only takes about seven to nine hours. The foot platform is removable allowing for gait training. The Medline Electric Stand Assist Lift has a weight capacity of 400 pounds, and serves multiple purposes. You can utilize it for gait training by removing the foot platform. This feature makes it possible for patients to get support from this device while still enjoying some independence. The components do not contain any latex, making it a viable choice for patients or caregivers who have latex allergies. The controls are easy to learn and use. They include a push button for emergency stop and reset. The casters are lockable for further security during transfers. The sling straps go into six hooks for added security; a standing sling is the type you use with this lift. This stand allows for easy storage and transport since you can fold it. The Hoyer Journey Stand Aid can accommodate up to 340 pounds. This stand allows for easy storage and transport since you can fold it. It also has a cow-horn mechanism that is adjustable. The sculpted kneepad is adjustable and soft, allowing for optimal patient comfort. This lift provides extra protection due to having a built-in bump guard. When initiating movement, the push pad offers patients additional assistance. This lift is ergonomic, making it easier to use and more comfortable for patients and their caregivers. Many of the adjustable features only require one hand, making them safe to use. The batteries that come with this lift are rechargeable. They are a 24V DC type of battery. The sling type that you will use with this device is a standing sling. This adjustable lift can accommodate up to 400 lbs. The Hoyer Elevate Patient Lift can accommodate up to 440 pounds. The kneepad is adjustable, and you only need one hand to make the adjustments. The foot tray is also adjustable, and it is removable for safer transfers. Use the transport sling for patients who are not mobile, or use this lift standing for those who have partial mobility. The safety belt has multiple configurations for comfort and safety. The sling type used with this lift is a standing sling. The Smart Monitor that is part of this device helps to promote greater lift longevity and user compliance. The sealed battery that comes with this lift is rechargeable. It is a 24V DC battery and has a relatively long life. Stand up lifts have a variety of features to explore. This information allows you to better evaluate the available lifts so that you choose the right one. Consider the height of the beds, chairs, and toilets in the patient’s living space to determine the best maximum height for the lift that you choose. Regarding the lower height range, think about the best height that will allow you to get a patient off the floor if they fall. There might come a time when the battery loses its charge prematurely, or there is a power loss. When this happens, you can use a lift’s emergency controls to ensure that the patient transfer is still safe. The lifts with these controls will allow you to use the device manually for transferring a patient. Emergency controls typically include manual override and emergency shut-off. For optimal safety, the weight capacity of the sling and the lift must be higher than the weight of the patient. It is possible for device component to fail or break if the patient weighs more than the lift or sling can accommodate. This issue puts both the patient and their caregiver at risk for falls and injuries. A standing sling supports the user with a sling around the upper back, under the arms and a band around the upper thighs. The patient positions their feet onto a footplate and braces their knees against an adjustable height pad. The patient’s full body goes into this type of sling, including their arms. This type of sling may be the most convenient since you can apply or remove the sling when the patient is sitting. This makes toileting easier since the sling, which is a full-body style, has a hole in the bottom so the patient can go directly onto the toilet. Patients may not be able to get onto a traditional scale safely, so having one that is part of the lift allows you to keep a better eye on their health without the risk of falls. The scales some lifts include will register a patient’s weight either in kilograms or pounds. Some give you the option to choose which unit of measurement you prefer. The base is the part that goes around toilets, chairs and other surfaces. The boom allows the device to lift the patient, and it is at the top of the device. The sling gets support from the cradle, and the patient is in the sling when using the lift. The casters ensure that you can move the lift around because they are wheels. The spreader bar is another critical element because it allows the base to close and open. This information about stand up lifts helps you to choose the best for your needs. Consider what you learned here to decide on the one that best fits your patient transferring needs.